Red, and your heart starts to race. Red, and your palms sweat. Red, and the sounds around you blur together. Imagine becoming emotionally aroused or distressed at the sight of simple stimuli, like the colour red, without knowing why. Because triggers like this can take the form of harmless, everyday stimuli, trauma survivors are often unaware of them and the distress they cause in their lives. And clinicians who practice without the benefit of a trauma-informed lens are less able to help clients make the connection. To address this and other concerns, researchers Nancy Poole and Lorraine Greaves in conjunction with the Centre for Addiction and Mental Health (CAMH) in Toronto recently published Becoming Trauma Informed, a book focused on the need for service providers working in the substance abuse and mental health fields to practice using a trauma informed lens. Becoming Trauma Informed provides insight into the experiences, effects, and complexity of treating individuals who have a history of trauma. Without a clear understanding of the effect traumatic experiences have on development, it is challenging for practitioners to make important connections in diagnosis and treatment. The authors describe how someone who self-harms may be diagnosed with bipolar disorder, possibly insufficiently treated with only medication and behaviour management. But using a trauma informed lens, the practitioner would more likely identify the self-harming patient as using a coping mechanism common to trauma survivors, giving rise to trauma informed care. Such care involves helping survivors recognize their emotions as reactions to trauma. And helping clients discover the connection between their traumatic experiences and their emotional reactions can reduce feelings of distress. Throughout the text, the authors describe an array of treatment options, pointing to ways they can be put into practice; for example, motivational interviewing to provide guidance during sensitive conversations, cognitive behavioural therapy for trauma and psychosis, and body centred interventions to allow clients to make connections between the mind and body, an approach that has become increasingly popular in recent years. Importantly, the authors emphasize that a single approach to trauma-informed care is unrealistic and insufficient. While all treatments should include sensitivity, compassion, and a trusting relationship between therapist and client, specific groups require unique approaches. The authors devote chapters to specific groups, including men, women, parents and children involved with child welfare, those with developmental disabilities, and refugees. 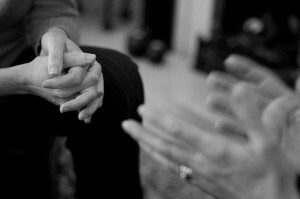 They outline different approaches necessary for trauma informed care in various contexts, such as when working in outpatient treatment settings, in the treatment of families, and when working with women on inpatient units, where treatment requires sensitivity to both the individual’s lived experiences and environment. A unique and compelling feature of this book is the focus on reducing risk of re-traumatization, an often neglected topic. Responding to the need for trauma survivors to feel safe, the authors outline how trauma informed care minimizes the use of restraints and seclusion (practices that can be re-traumatizing), and they offer ways to reduce the risk of re-traumatization by placing trauma survivors in less threatening situations, where they are less likely to feel dominated. This may involve matching female clients to female therapists or support groups comprised of only females. The numerous case studies help illustrate specific scenarios, challenges, and outcomes of trauma informed care and highlight the growing recognition of the link between substance abuse, mental illness and traumatic experiences. While the text is theoretically grounded, the authors convey information in a way that is accessible to wider audiences. It provides critical information for those working in the field by underscoring the relationship between past experiences and current functioning. Becoming Trauma Informed delivers a deeply informative look into the field of trauma therapy.